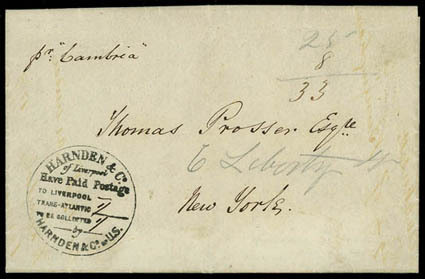 1845 (Nov. 19) Liverpool, England to New York, N.Y., folded letter carried privately by Harnden & Co. with black Liverpool company handstamp indicating transatlantic fees of "1/" shilling to be collected upon delivery, carried by Cunard Line Cambria from Liverpool Nov. 19th to Boston arriving Dec. 4th, pencil "25" cent equivalent plus 8¢ for transit from Boston to New York totaled to "33" cents due by addressee, New York marked the street address of "6 Liberty St", Very Fine, ex-Winter. If the letter had been mailed in the British system, one shilling would have been prepaid in Liverpool plus 7¢ due in New York for a total of 31¢. A link back to Sale 75 - Lot 199, along with its description, will be appended to your message.